I am about to embark on an interesting inquiry – and I hope you’ll join me occasionally. In a somewhat similar way, I hope to crowdsource a compilation of instructional strategies and design patterns for online learning. (You may think not quite as exciting as being marooned on Mars — but I think otherwise.) I want feedback on what works and what doesn’t work in online content-to-student interactions. I can make some educated guesses based on my own readings, research and experience – but I really want to hear from you and others in our field. I want to test drive some ideas. I want to stop marooning instructors in the 21st century without tools to survive. This is certainly a contribution that doctoral students in instructional technology can make to the field of online learning. I would love to see quantitative and qualitative analyses of the use of specific design patterns, much in the same way that Richard Mayer’s primary research led to his principles of multimedia learning. This will be a playful experiment. I will dust off some time-honored designs and strategies and try them out. I will also get my inspiration from new sources and try out new patterns. For some of the patterns, I won’t know from experience whether or not they will work. Feedback from instructors, students and online learning practitioners will help refine the patterns, accept or discard them. I make a distinction between instructional strategies and instructional design patterns – which may, in the end, not be a particularly helpful one. For now, strategies relate to simple things like techniques to help engage students. For example in our university’s Teaching Online Institute, I display a spiral and ask participants how the spiral relates to the Fibonacci sequence. Participants think about it for a minute and then I reveal the spiral with the numbers superimposed (1,1,2,3,5,8,13…). It is either an affirming moment or an ‘aha’ experience. Reveals are a simple strategy. Not too complicated. There are hundreds of strategies like this one. Pre-training on a topic or the simple underlining of key words — or as Richard Mayer calls it, signaling — are other examples of simple strategies. An instructional design pattern is more involved. It is not one technique but a fairly defined sequence of activities designed to engage the student. Instructors can’t just use an instructional design pattern ad hoc; they have to plan carefully. My classic example is the WebQuest from Bernie Dodge. It has a well-defined pattern that I have written about in the past, which is made up of an introduction, a statement of task, a description of the process by which students will complete the task, a set of links that will serve as helpful resources, and a statement of how students will be evaluated. It is based on an inquiry learning approach that is so useful in online instruction. Another example might be the simulated interview. I’ll write about this in the future, but in a nutshell it involves a simulated dialog between the student and an on-screen character in some sort of scenario. The character says something through audio or a speech bubble and the student responds by selecting one of several options of dialog. We used this pattern to rehearse faculty on an approach to integrated design. The faculty member is immersed in a scenario, is evaluated on her choices and then assigned points and given feedback. As you can see, this is not just a simple strategy or technique; it is a whole structure that involves choices, coaching, visual performance indicators and so forth. In the next few months we’ll uncover and discover strategies and designs that promote student engagement with online learning. (‘Designs’ is my short form for instructional design pattern). As I’ve written I have some time-tested strategies and designs, but I am in search for more. I would love for you to provide feedback on those I propose and I want to hear your suggestions for new ones. My response to some of the suggestions will be to build activities from proposed patterns and test them on students. My antennae are up for patterns. I’m uncovering them everywhere. A case in point: Recently, my wife and I traveled to Louisiana for a workshop sponsored by Southern University’s Science Math and Engineering Doctorate program. On the way, we stopped at Table Rock dam at the edge of the Ozarks. At the interpretive center there was a kiosk that challenged visitors to make a decision about water management. The kiosk presented a scenario that included the amount of rainfall and information on the capacity of the reservoirs in the flowage. I watched my wife deeply engaged by this kiosk. Eventually, we both reviewed the information, examined the map and discussed which options we would choose. She chose right; I chose wrong. This reminded me of the interactive kiosks that I so much enjoyed as a young teen at the local science center. From Table Rock and my past experiences, I walked away with a proposed design pattern. The following article explores this design pattern in detail and why it has the potential to engage students. In the future, I’ll skip the preamble. What follows is not only a description of a video scenario design pattern but a proposed structure on how to discuss it. Comment on both, please. Present students with information. Make it in the form of a problem solving scenario. Invoke an emotional response. Challenge students to review the information and a set of options and then select the option or options that are best. 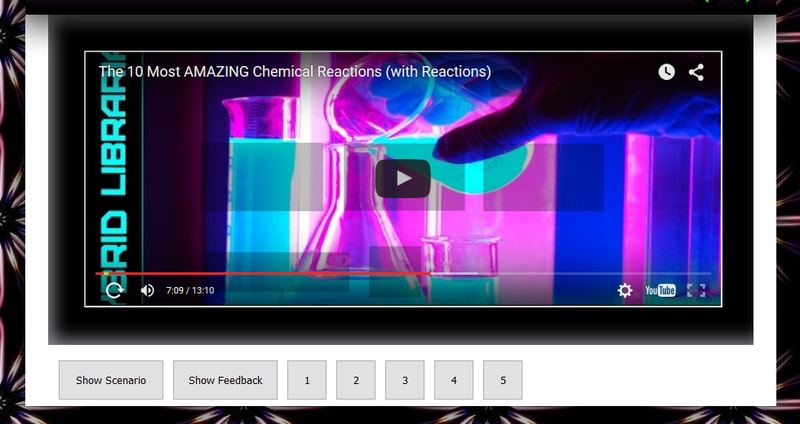 Play out the feedback in the form of video, assign points and provide textual feedback. Provide follow-up resources. A screenshot of LodeStar Learning’s video scenario page type found in the ActivityMaker template. Humans are fascinated by uncovering and discovering. They are engaged when they must think about and manipulate things and get immediate feedback. Sivasailam Thiagarajan ,affectionately known as Thiagi, offers an explanation borrowed from Dr. Seymour Epstein, University of Massachusetts. The Video Scenario Design appeals directly to the experiential mind. We also anticipate other laws in play. Thiagi, in his talks and in his writings, lists seven laws. Some of these have shaped our design pattern. These laws square with my own experience and so I cite them. You can judge for yourself which laws are in play in the video scenario examples. Another important dynamic relates to Leon Festinger’s theory of cognitive dissonance. The artful use of this effect is an important strategy in the designer’s tool bag. Briefly paraphrased, cognitive dissonance is the students’ attempt to achieve consistency between new information and what they know to be true. Students who experience inconsistency (dissonance) become uncomfortable and are motivated to try to reduce their discomfort. Our first example of a video scenario leverages the effect of cognitive dissonance, as well. Start with a quick overview presented in text form or video. Make this brief. Launch as quickly as possibly into the video segment that will remind the student why she/he should care about the topic. In our demonstration, we played a segment from Tom Brokaw’s presentation on Global Warming. Pick a credible source and get the student emotionally involved in the subject. Add a slide (or page) that makes it clear how the student will be evaluated. In our video scenario, each option is worth points. Good options are worth more than bad options. In our scenario, we followed an independent consulting firm’s ranking of alternative energy sources. Our top choice was assigned 12 points. The student would earn 12 points if s/he chose that option on the first try. 6 points on the second try, and so on. If a student simply chose each option from left to right, he would earn less than 50% of the available points. The total available points are 20. A student earns 20 if s/he makes good choices as early as possible. Each option is followed by a video. The video sometimes either explicitly or implicitly reveals the merit of the choice. Each option is also coupled with explicit feedback that also states the number of points the student has accumulated. By this time, we hope we have maintained the student’s interest and offer additional videos. A screenshot of LodeStar Learning’s Video Scenario page type. 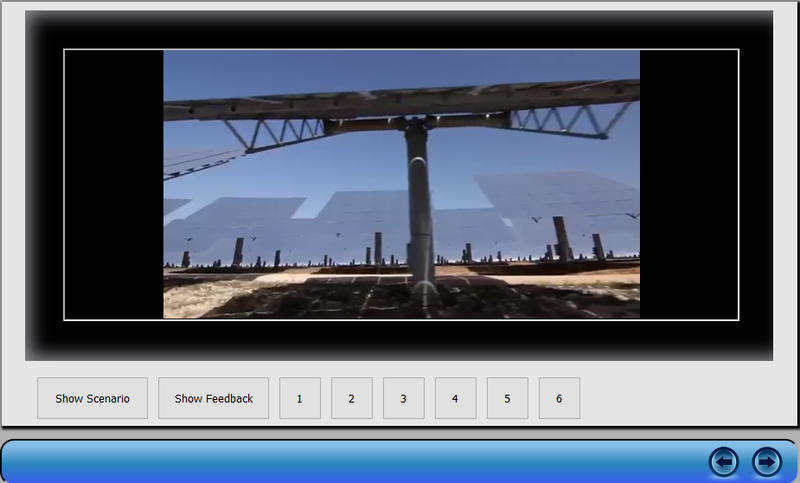 In our second example, we demonstrate how the video scenario can be applied in different way. We challenge students to pick combinations of substances that lead to chemical reactions. Bad choices severely reduce points. Give it a try. One important criteria for instructional design patterns is that they are easy for instructors to use. The designs that we choose to discuss are those that can be implemented with a variety of tools such as Adobe Captivate, Allen Learning’s ZebraZapps, Articulate StoryLine or whatever tool supports the creation and use of templates, including our tool, the LodeStar eLearning Authoring tool. Templates are important because without them the task of implementing an instructional design pattern for instructors is too daunting. When I served as an instructional designer on projects paid for by Fortune 500 corporations, budgets and project schedules were fairly healthy. In contrast, instructors have neither money nor the time. Templates enable them to build sophisticated interactions without programming knowledge and enable faculty to focus on the content and needs of their students. Toward that end, LodeStar Learning has added the Video Scenario page to the ActivityMaker template to make it easy for instructors to implement all or some aspects of the video scenario design. This page type is available in LodeStar 7.2 build 20 +.